'Just added brand new queen size Murphy bed and mattress' that folds up to the wall with fold down table giving you more space. Did i say location? This condo is in a 'great ' location, just steps away from alii drive the main street that drives thru town along the ocean, my condo is very cute, with hawiian and asian inspired decoration, very comfortable, Turn Key, now with brand new queen size Murphy bed and mattress that folds up to the wall with fold down table giving you more space, pictures coming soon, full size living room, full bathroom, oceanveiw lanai, fully furnished kitchenette with range top stove, toaster oven, microwave, brand new full size refrigerator, all linens, cable tv, internet, dvd, phone, pool, jacuzzi, BBQ, in town, walk to all resturants and shopping, 1 blk to beach& and peir where all water sports leave from,(snorkeling, suba diving, parasailing, kayaking, whale whatching, dinner cruises). Close to Kona Ironman Triathalon,finish line 2 blks away, Close to airport, 15 minutes away. Pool, Jacuzzi, Barbeque, Ocean View, Lanai, In Town, 1 block from beach and Pier where all water sports depart from, walk to all resturants, shopping and entertainment. Fully furnished kichenette, full bathroom, brand new queen size Murphy bed and mattress that folds up to wall with fold down table giving you more space, full size living room, partial oceanveiw lanai, flat screen cable tv, internet, dvd, phone, range top stove, toaster oven, microwave, full refrigerator. 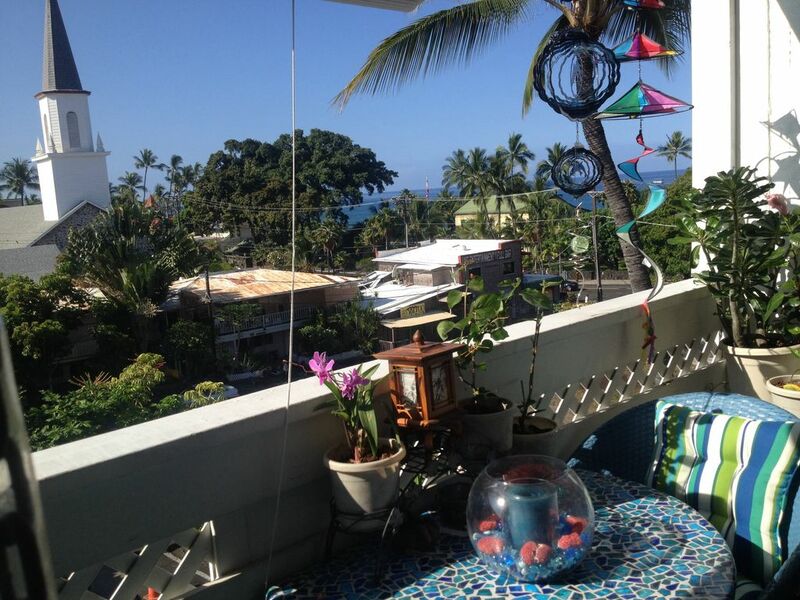 This place is just right for a couple looking to stay right in Kona close to everything. It was the perfect fit and made our vacation memorable. Great little place. In downtown--not just close. Small cleaning snafu which Toni dealt with quickly. Friendly people in the complex. Felt safe there. Walk to beach 1 blk away, or 2 beaches 1 or 2 miles away, rest of beaches drive;15 mins to 45 mins, pier 1 blk away, Kona Triathalon,where all water sports depart from,(sorkeling cruises, whale watching cruises, dinner cruises, luas, parasailing, scuba diving, snorkling, kayaking, fishing, snorkling,;surfing and boogie boarding)Walk to all resturants, entertainment and shopping. lower monthly rates for 2, 3, or 4 months rental, slightly higher refundable deposit for longer stays.